WASILLA, Alaska (CNN) -- Alaska Gov. Sarah Palin, who will leave office Sunday, made it clear to hundreds gathered at a picnic in Wasilla on Friday night that she loves her hometown. Alaska Gov. 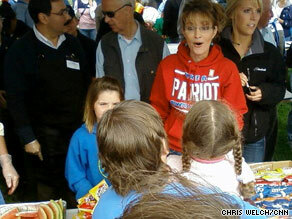 Sarah Palin visits hometown of Wasilla two days before stepping down from her post. "This being my last time to speak to the valley community as your governor, I do want to tell you sincerely that I love you," Palin said at the annual Governor's Picnic, in one of her last speeches as governor. "I appreciate you and your support, the support that you've shown my family. God bless you and God bless America." Shouts of "We love you Sarah!" and "Sarah Palin in 2012" accompanied applause as she finished. Few seemed to have an unfavorable view of the 2008 Republican vice presidential nominee at the event, which honors men and women in uniform. A nationwide poll released Friday indicates that a majority of Americans have an unfavorable view of the outgoing governor. But the ABC News/Washington Post survey also suggested that seven out of 10 Republican voters maintain a positive opinion of Palin. Fifty-three percent of those questioned in the poll view Palin negatively, with four in 10 holding a positive view of her. The survey suggests that there is doubt about Palin's leadership skills and her understanding of intricate issues. Fifty-seven percent said they don't think Palin understands complex issues, and 54 percent do not feel she is a strong leader. Palin recounted a recent interview with a journalist after telling the crowd she won't use her time to "talk politics." The reporter suggested she had had a "rough day" and had been framing the questions in a way to elicit a "pessimistic" response, she said. "I said, 'Oh no, it is not a down day -- my son called this week from Iraq," she said. "He is safe, he is sound. It is always a good day when my son calls from Iraq. "I wish that some in the media would keep things like that in perspective, what is really important in our country." The governor will attend a similar event in Anchorage on Saturday before she transfers gubernatorial power to Lt. Gov. Sean Parnell in Fairbanks on Sunday.